LOTS of First Friday Options – Even on a Holiday Weekend! Ok Raleigh kids… what’s on the agenda for #FirstFriday in #DowntownRaleigh? I’m making my list now! @artspacenc – Artspace has it going on! We’ve got our Summer Artist in Residence here setting in Gallery 1- come on down! @_huddy_ – Come on down to @Fragmentlabs and check out the jewelry on display from Jaclyn Anthony. Event opens at 6:00pm, band starts at 7:30pm – tonight featuring Peter Lamb and the Wolves. Music on the Porch is a grassroots community event featuring free music every Friday night this spring, summer and fall. The place to visit for LOTS of unique local finds tonight! 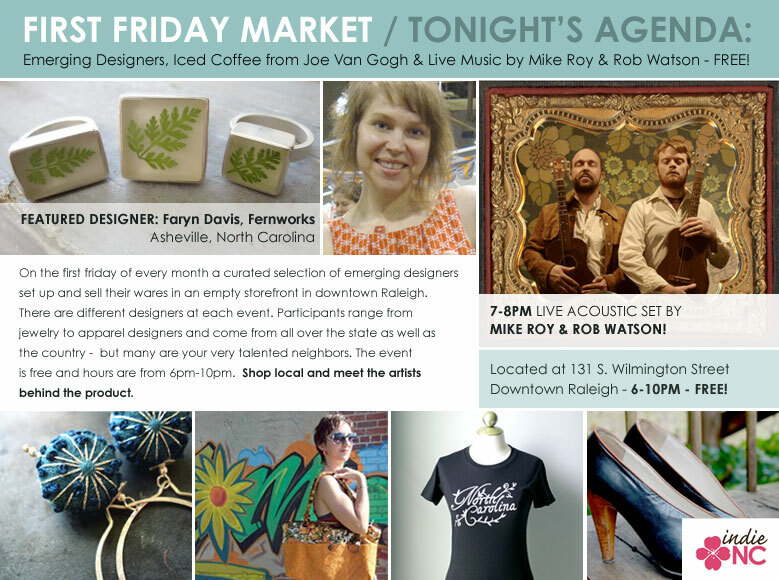 Located at 131 S. Wilmington Street (in Downtown Raleigh), this once-a-month market features emerging designers, iced coffee, and live music from Mike Roy and Rob Watson this evening from 6:00pm until 10:00pm. WKNC is launching a series of Raleigh Afterhours dance parties at Jibarra starting on July 2. These events are meant to showcase the Afterhours DJs and are free and open to the public for anyone 21+ and only $3 for those 18-20. All of the money collected at the door goes straight to WKNC. Need to get around to all of these great events? Park your car once and then hop on the R-Line -Raleigh’s free downtown circulator bus! Check out the mobile site and pick up the bus when it gets to a stop near you: www.yourhere.com/mobile.